mAlert Manager is a client server application providing firstly a register of assets and equipment which are subject to maintenance and secondly a register of maintenance tasks due. Each piece of equipment is allocated to a custodian and responsible officer and maintenance tasks are recorded and scheduled for each asset. The system is simple. Import assets from an spreadsheet, add service tasks and you’re done. According to the schedule generated by asset service intervals, responsible officers are alerted of the maintenance required. They must attend to the maintenance and respond and acknowledge to the service alert to avoid an escalation to a senior officer. 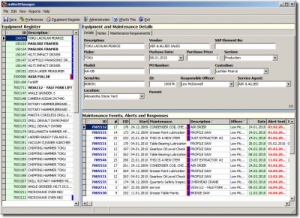 Additional options provide for service agents to be alerted to the service requirements. The service motivation is placed in the hands of the agent to arrange the service. 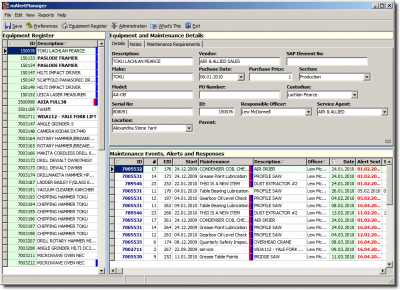 mAlert Manager can be operated as a standalone windows application or as a full multi-user, client-server application, allowing all officers access and fully automating both service alerts and service requests.